After arriving in Edinburgh, we went to our hotel thinking we wouldn’t be able to get into our room until that afternoon. Lucky for us the room was available, and we could rest there for a bit before taking in the city. Our first day in Edinburgh took us to the Scottish Parliament. The Scottish Parliament re-formed in 1999 after being disbanded in 1707. The new parliament building opened in 2004. Being in such a new government building (especially considering the age of many buildings throughout Scotland) was interesting. Most of the building is made of concrete and includes architectural references to Scotland and democracy throughout. The architect, however, died before the building was completed. The day we toured the parliament was also election day, so there were no MSPs around. In fact, they had to move all items from their offices. The election resulted in an overwhelming victory for the Scottish National Party. 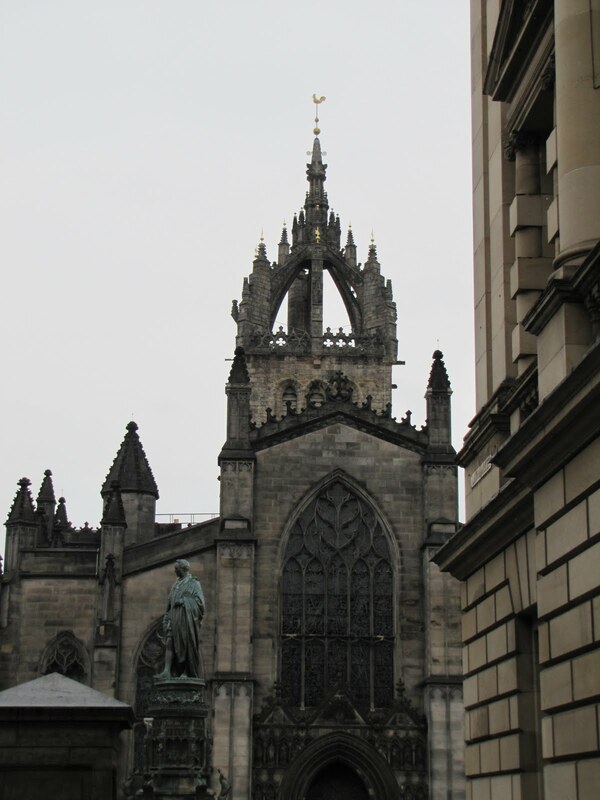 After our tour, we walked part of the Royal Mile. The Scottish Parliament, across the street from Holyrood Palace is at one end of the Royal Mile and Edinburgh Castle is at the other. The walk from the parliament to the castle is, of course, all uphill. After we left the cafe, we visited Canongate Kirk, which was built in 1691. The interior of the church was beautiful and peaceful and welcoming. The cemetery around the church is also the final resting place of Adam Smith. Our next stop was St. Giles’ Cathedral. and Greyfriars Bobby’s story has been told in books and movies. 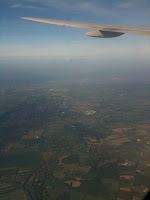 and left Edinburgh for our tour around Scotland. 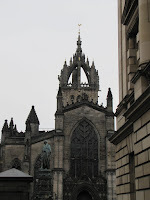 We returned to the city the next week and finished walking the Royal Mile. Then we visited Edinburgh Castle. Inside the castle walls, we saw St. Margaret’s Chapel which is the oldest building on the castle grounds and dates to the early 1100s. We also visited the Scottish National War Memorial. The building was originally built to honor those Scots who died in the Great War but has since been dedicated to those who have died in all subsequent wars. The inside of the building, in which photography was not allowed, listed the various regiments of the military branches and the number of soldiers who died in each regiment. The sheer amount of people who were slaughtered in World War I was staggering. And these numbers referred only to those from Scotland. I had always heard that World War I killed nearly an entire generation of British men, but until I saw the numbers carved in stone on the walls of that memorial I had never been truly understood that fact. We also saw The Honours of Scotland, which are the Scottish crown jewels. These are the oldest set of crown jewels in the British Isles and include a crown, a sceptre and a sword. The exhibit also included the Stone of Destiny. After we left Edinburgh Castle, we walked to the Museum of Scotland and looked at some of the exhibits. One of the highlights for me being the Maiden. 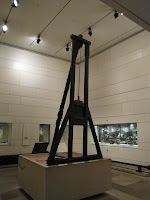 a precursor to the guillotine. 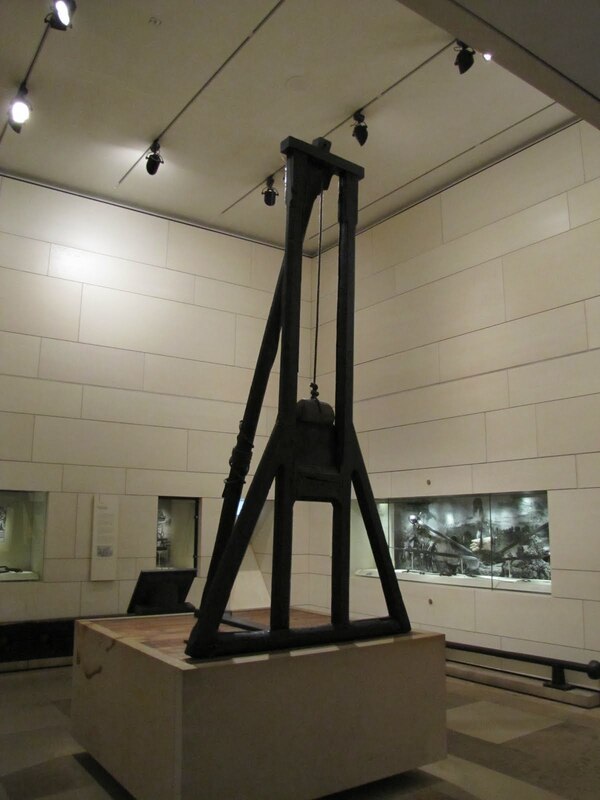 Since I’ve written a young adult novel set during the French Revolution, seeing this instrument of execution, which so closely resembles the French one, brought the details closer for me. 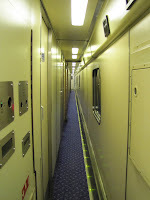 On our final day in Edinburgh, we toured Her Majesty’s Yacht Britannia. But that needs to be its own post because it was amazing. 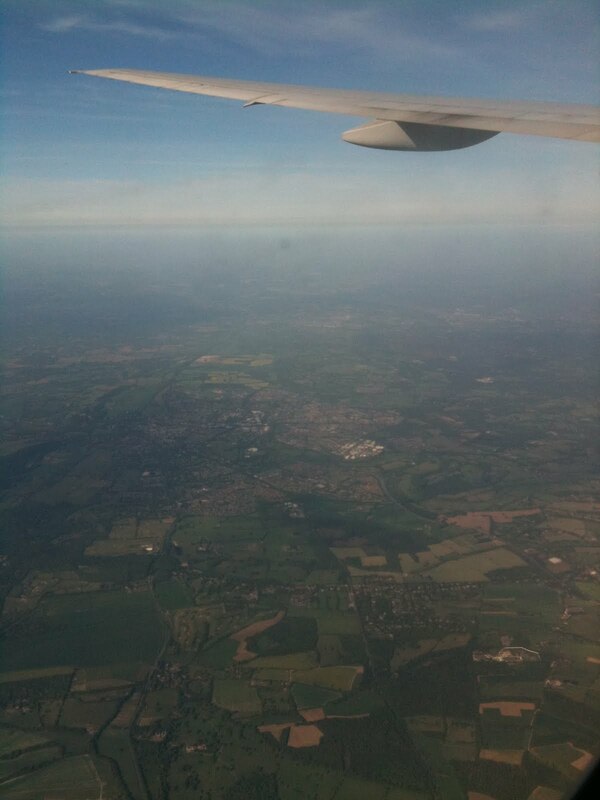 We flew direct from Houston to London. During the flight, I watched Season of the Witch with Nicolas Cage, and it was awful - a prime candidate for a bad movie night with a group of friends. I tried sleeping, but it was difficult. The flight was quite rough. 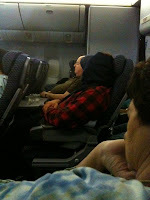 Mom said it was the worst flight she had ever been on. Although one person didn’t find it difficult to sleep. 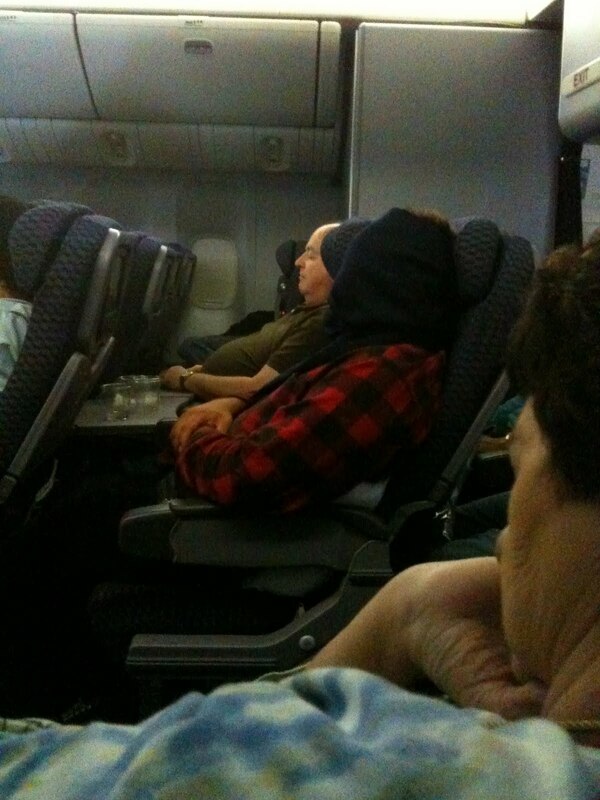 I don't how he could breathe with that blanket wrapped around his head. we took the Tube to Euston Station and picked up our train tickets for the trip to Edinburgh. 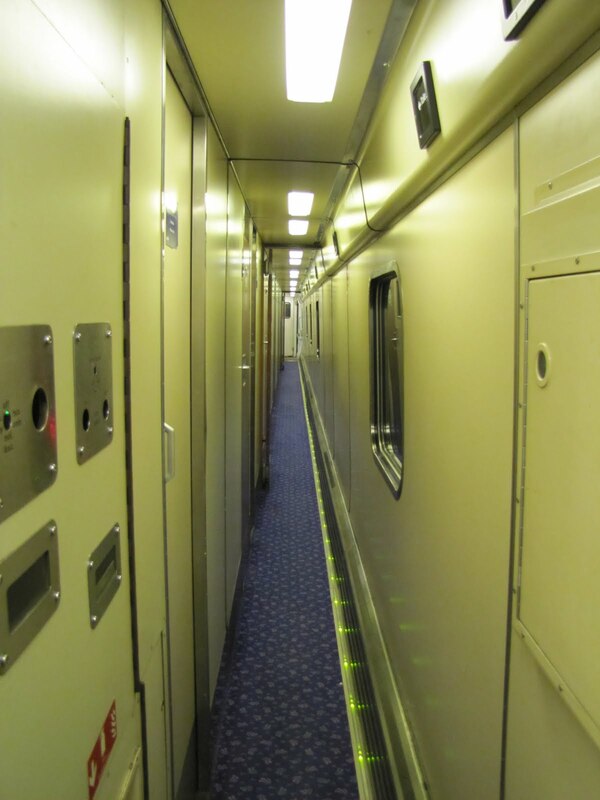 But our train didn’t leave until midnight, and we had almost 12 hours to spend in London. 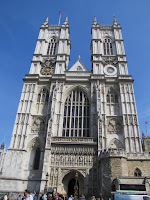 Since the Royal Wedding of Prince William and Kate Middleton had happened less than a week before our arrival, Mom and I went to Westminster Abbey. 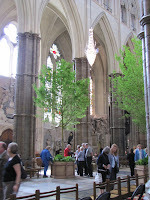 The flowers and trees placed in the church for the wedding were still inside. 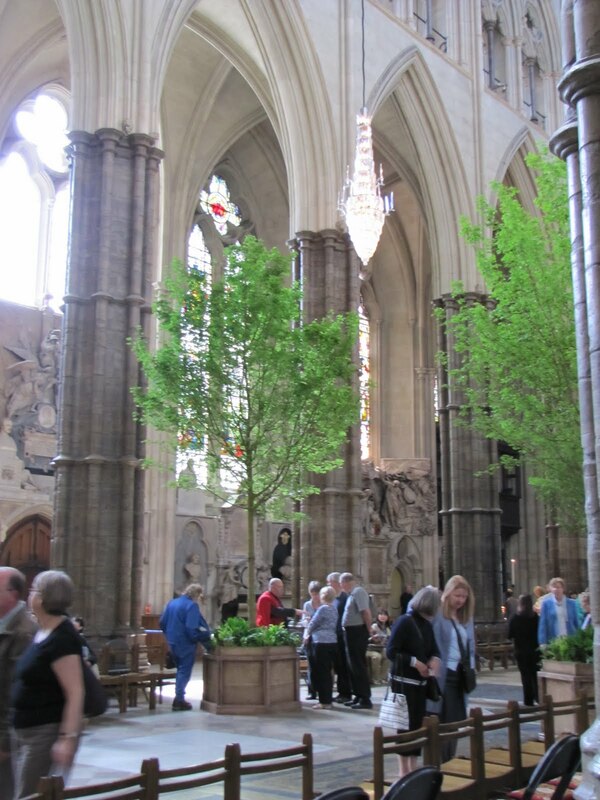 Pictures aren’t allowed inside the abbey, but I sneaked this one of the trees. The trees were just as lovely in person as they were on television, but what the TV cameras didn’t really pick up were the flowers. 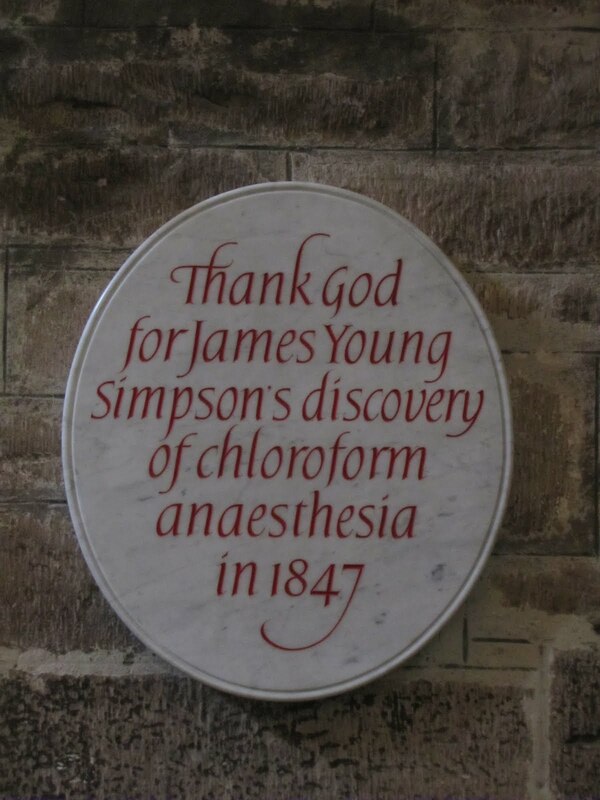 They were subtle and scattered throughout the church in just the right places lending the entire abbey a sense of the outdoors that was not there when we first visited in 2009. After that visit, we hung around the train station and people-watched for many an hour. Finally the train arrived. 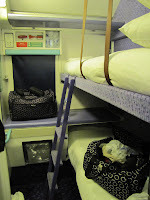 We took the Caledonian Sleeper from London to Edinburgh. The hall was tiny. The bathroom was down the hall, and the faucet didn’t work. But after being awake for nearly two days, we slept.